1. Pre-plan trips: Planning your getaways in advance is always advantageous. Had I not been hesitant to book my Megabus tickets initially, I would’ve gotten them for one dollar. You can benefit from these kind of crazy offers if you’re one of the first few passengers to book your tickets on the bus. Since bus, train and flight tickets get expensive round the holidays, it’s best to book them as soon as you can. If you have a friend group that can assemble travel plans quickly, you can have an affordable excursion. 2. Friendsgiving: This contemporary take on the traditional holiday has gained a lot of steam in the last couple of years. Gathering a group of friends for a potluck-style dinner can never go wrong. Feeling like you can’t possibly stuff any more food into your mouth is a great way to end the night. 3. Get to know the city: This one is especially useful for freshmen who haven’t had time to really get to see Boston (or seniors who have been slacking on leaving their dorm over the past three years). 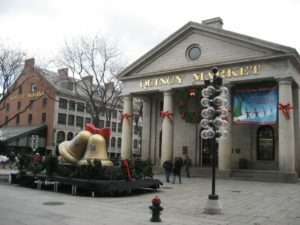 The city often has scheduled walks along the Freedom Trail during the holidays which is a great way to meet new people in a similar situation as you, plus you get to sightsee. 4. Dinner and Netflix for one: Don’t be afraid to use the break to unwind and utilize the time to treat yourself. There’s nothing wrong with being alone, especially if you don’t feel lonely. Make your favorite food and settle down for some much needed R&R and a binge of your best-loved TV shows.